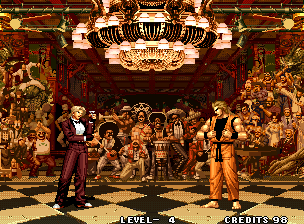 STORY: Rugal Bernstein is an incredibly rich and notorious arms and drugs trafficker, as well as an incredibly skilled and ruthless fighter. 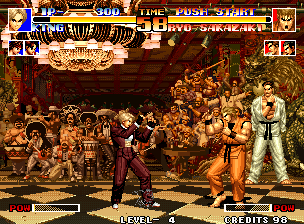 Having become bored with the lack of competition, Rugal decides to host a new King of Fighters tournament. Rugal has his secretary travel to eight destinations around the world and invite fighters to his new tournament. 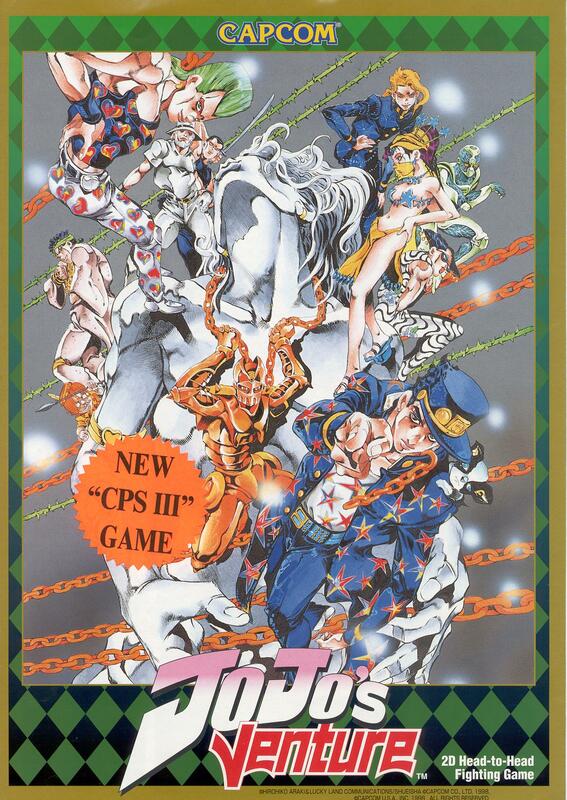 Fatal Fury VS Art of Fighting?!? Oookay! 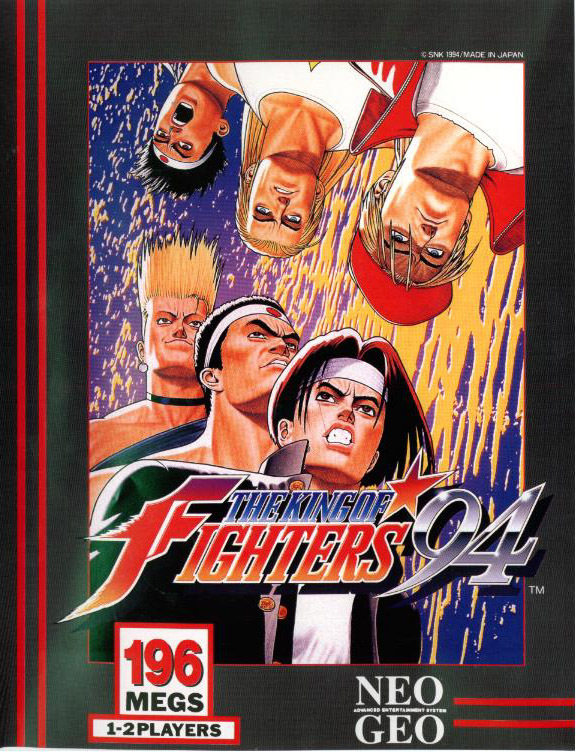 REVIEW: The King of Fighters '94 is the first installment of what would later become SNK's longest-running and most successful fighting series. 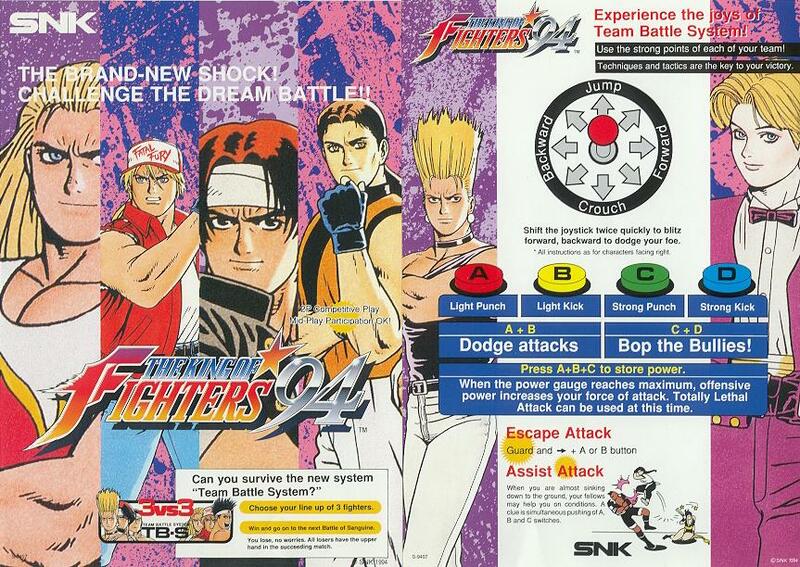 KOF 94's premise alone is simply epic, especially for fans of SNK's earlier hand-to-hand 2D fighting games. 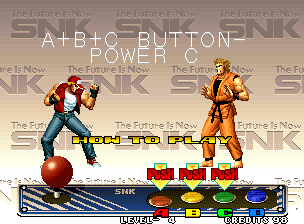 "The Future is Now"... 3-on-3 battles featuring SNK's most well known characters from arcade hits such as Fatal Fury and Art of Fighting! 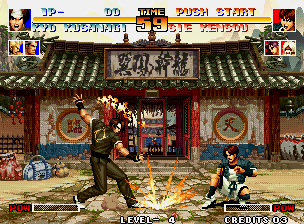 In addition, "reimagined" versions of characters from other classic Neo Geo games (such as Psycho Soldier and Ikari Warriors) also make their fighting game debuts in '94. Fatal Fury team here to represent! 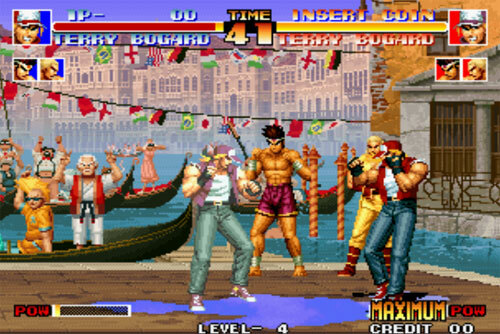 Players can choose from one of 8 different teams (representing a different country), each consisting of 3 members. 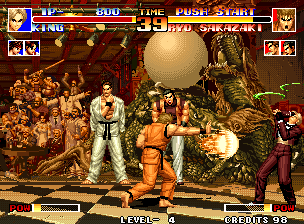 King of Fighters '94 plays like a staple 2D fighting game, using a simple 4-button control scheme with the staple punch and kick commands. 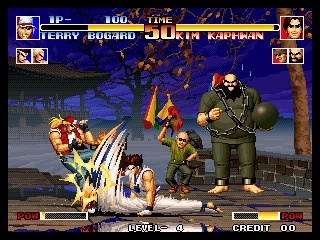 However, KOF '94 offers up some unique gameplay mechanics, including: Evading, Bop Attacks and Super Meter Charging. 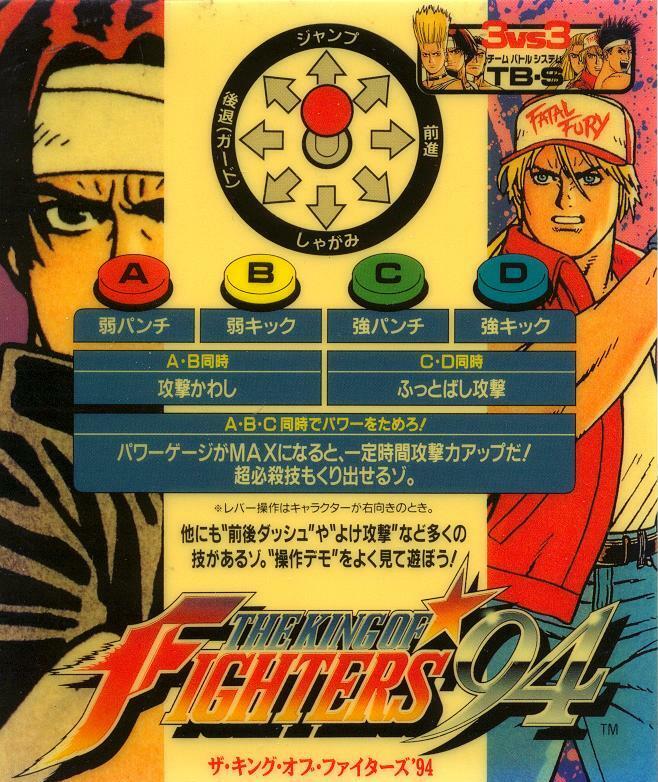 Comparably to Capcom's latest fighting game effort in 1994, Super Street Fighter 2 Turbo, KOF '94 offered something very distinguishable to the genre... although, KOF '94's gameplay definitely felt pretty "stiff" compared to Capcom's iconic franchise (among other titles). 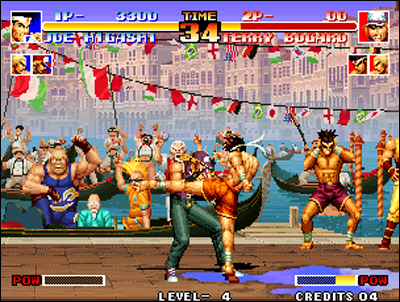 However, what KOF '94 lacked in smoothness, it made up for in "style" and arguably in its "advanced" gameplay engine for the time. 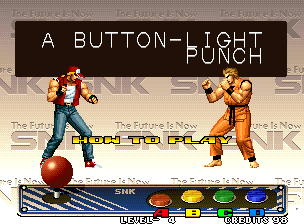 KOF '94 was definitely ahead of its time. 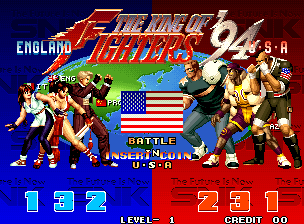 Along with the interesting gameplay elements, KOF '94 offers some pretty fun 3-VS-3 match-ups (non tag). Each team has their strengths and weaknesses, and unlike in the sequels, players can not pick individual characters... only teams. 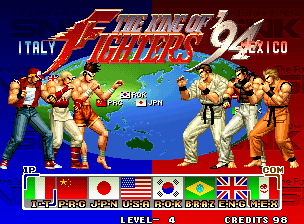 KOF '94's character roster was a rather decent size for the time, although the fact that players couldn't "customize" their teams was a definite flaw (something that was fixed in KOF '95). 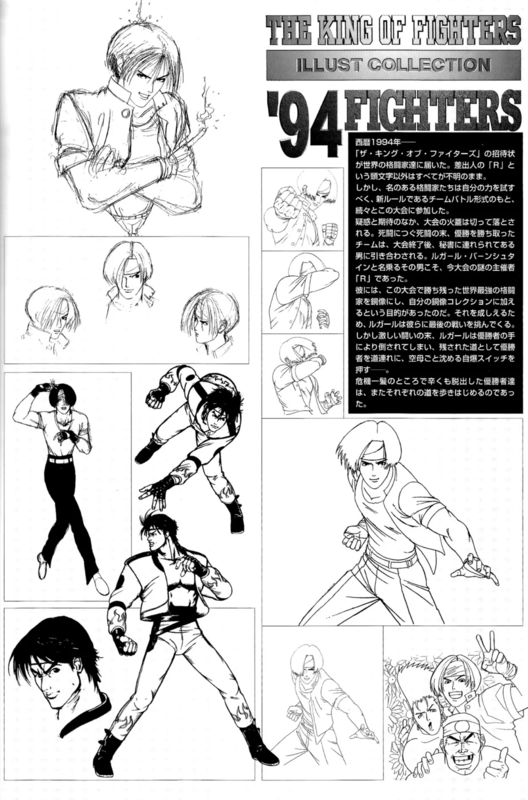 Graphically, KOF '94 presents "realistically proportioned" 2D character sprites, which actually brought something unique (and possibly refreshing to the fighting genre at the time. 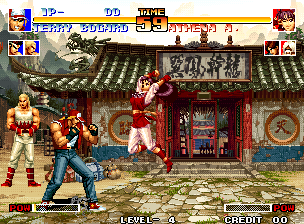 On the flipside, you could also say KOF 94's graphics were a bit drab and heavy on pixels. 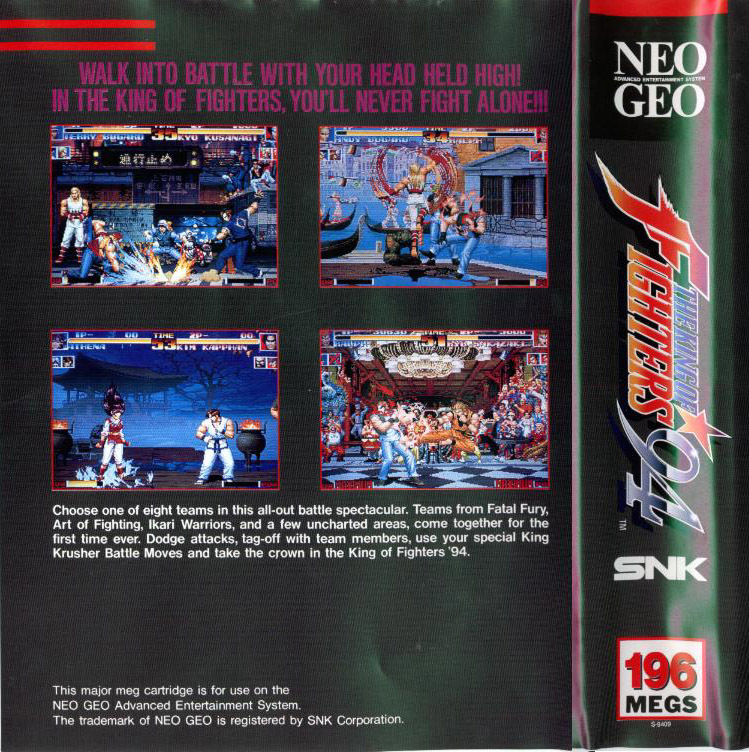 Any way you shake it, KOF '94 definitely wasn't the prettiest 2D fighter around in the mid 90's. The sound and music quality is also fairly mediocre. 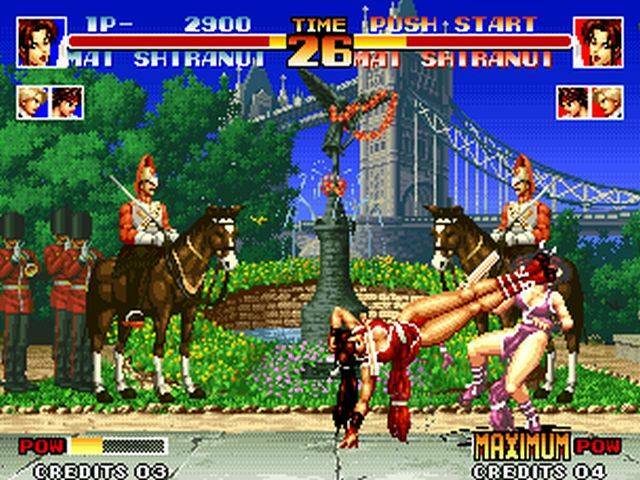 As a big fan of Samurai Shodown and Art of Fighting at the time, KOF 94's art style and (arguably) "gritty" in-game graphics and sound didn't really manage to impress me. 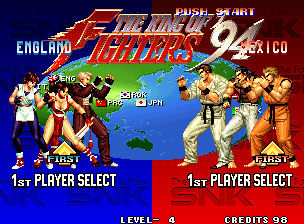 (However, I later became a big fan of the series, after KOF '97 & KOF '98 arrived). 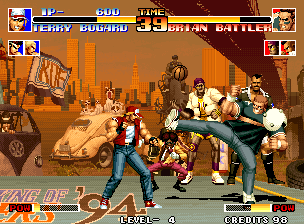 On certain stages in KOF '94, the sharp pixels of characters and backgrounds just seem to "blur" together, and sometimes isn't as "easy on the eyes" as other 2D games I know and love. 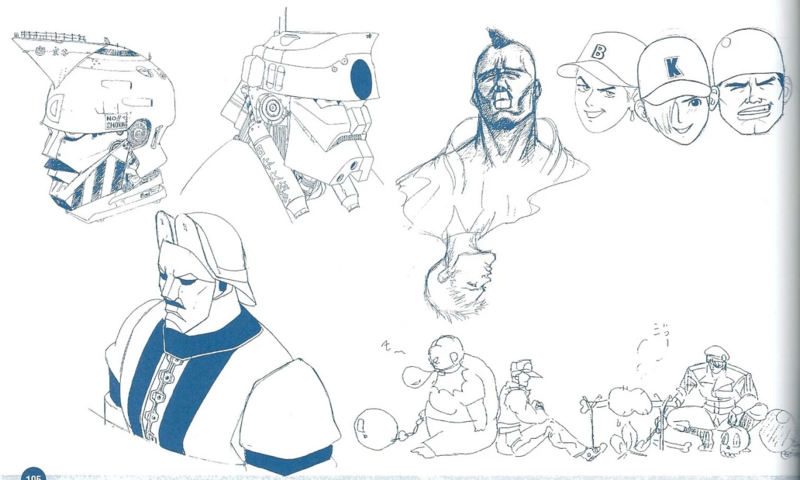 Nonetheless, the cool 2D character sprites and hand-drawn backgrounds do have a unique flair of their own. 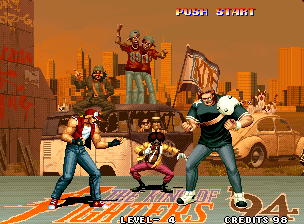 One of the coolest and most unique visual aspects of KOF '94 is that your eternally supportive teammates are seen in the background during the fight, cheering you on when you land attacks. That subtle detail alone definitely added a ton of personality to the game, and would also carry on to future sequels. 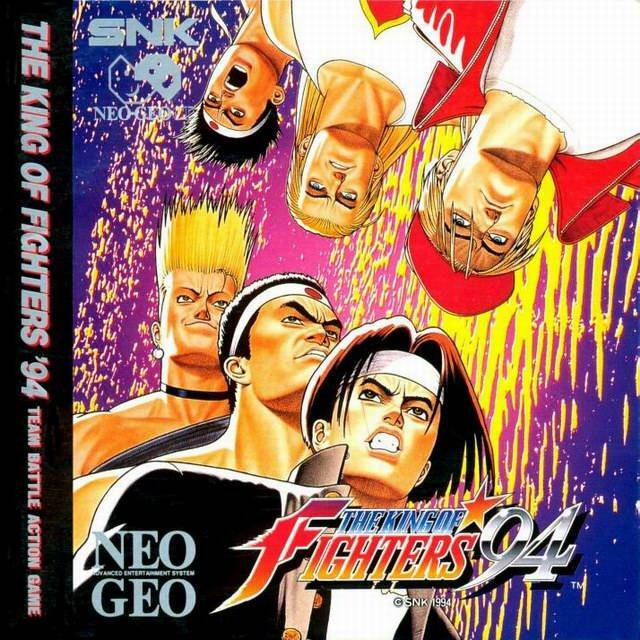 KOF '94's 3-VS-3 match-ups were definitely innovative for the time, but the sluggish and slightly "stiff" gameplay was no doubt the biggest flaw of the game. 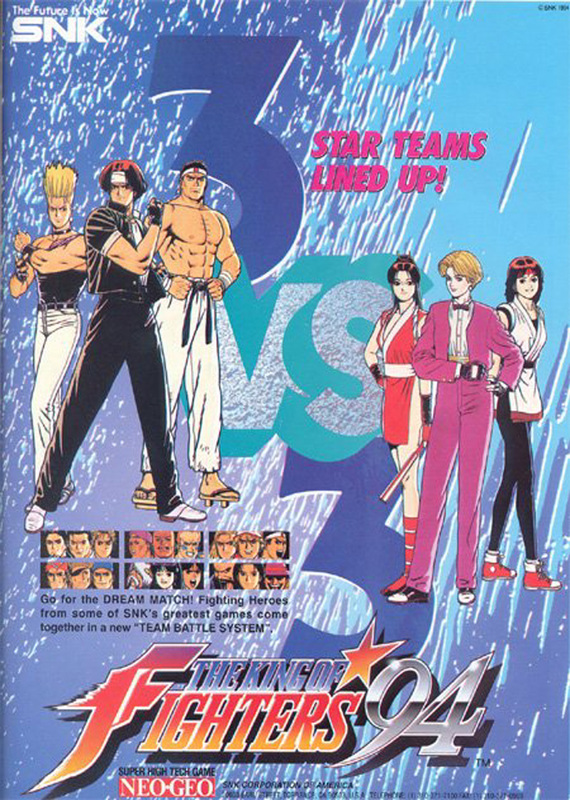 An inexperienced fighting game player might not notice this "stiffness" I speak of... but comparing KOF '94 to other hit 1994 fighting games, such as: Super Street Fighter 2 Turbo, Mortal Kombat 2, or even SNK's own Samurai Shodown 2... King of Fighters '94 clearly wasn't the cream of the crop at the time (no matter how thick your nostalgia glasses are).